In his blog post at KevinMD.com physician Neil Baum shares a startling insight about annual income in the medical field. Let’s begin with the premise: The general public believes doctors make far too much money for their services. Now let’s consider the insight that debunks that notion: Hard-working men and women who take a job driving a truck with United Parcel Service (UPS) at the age of 18 actually have a large head start on healthcare professionals and outperform them for about 17 years. Don’t believe him? Take a look at the chart. Here is the salient point: While most physicians are studying and accumulating a debt of about $225,000 over an 8- to 10-year period, UPS truck drivers are earning money. Then, after health professionals enter the job market, they may earn very good money, but they must pay down their enormous debt. On the chart, the brown line indicates income for UPS employees; it rises at about a 45-degree angle, slow, perhaps, but steady. Meanwhile, the red line shows physicians’ economic life dipping before beginning an impressive rise. Please note where the brown and red lines cross. Then trace your finger down to the bottom line on the chart that marks the years after high school: the intersection is near the 17-year post-high school mark. But what is the green line? 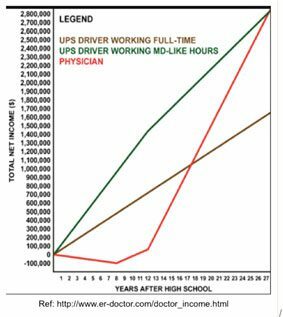 That projects income for a UPS driver who works as many hours per week as most physicians put in. Although theoretical, this comparison stuns: it would take doctors about 27 years to match the financial performance. Those of us who chose a career in medicine would likely make the same choice again: we are driven to serve. But will the general public ever appreciate the hole most of us must dig out of before reaching economic parity? Thank you, Dr. Baum. Your blog post and chart reveal an unexpected truth that is well worth pondering. Yet your good work got me to thinking about our colleagues. Obviously, this is not a class war issue: Truck driver vs. Healthcare pro. Who among us does not appreciate the UPS employees who deliver our prized packages daily? Their hard work is impressive. And enduring those long years of labor is no easy feat. Even so, I must ask my fellow doctors, are you ready to shrink that 17-year climb? What if the time needed to equal UPS workers financially was only 10 years? Or 7 years? How would that impact the quality of your life? Too many physicians burn out early and live lousy lives because they don’t take a hard look at their finances—at the beginning of their professional life. Hey, maybe the same is true of UPS drivers. Not everyone has the dedication and drive to stick with the plan. But doctors have the potential to make an impressive annual income as soon as they enter the job market. They have more money to work with in the early stages of their career than most workers in other fields. The problem is the debt. The good money we earn must be put to work immediately to diminish our enormous debts. But how? By adding more debt. Let’s not talk politics. I respect your beliefs. Instead, let’s acknowledge that one presidential candidate has written a book called The Art of the Deal and claims to have “brilliantly” used tax laws to create wealth. The truth is, multi-family real estate does not exploit tax laws but rather benefits from them when claiming depreciation of properties owned. But make no mistake: some types of real estate allow investors to take a loss (on paper) and yet still earn passive income. To earn a living, the UPS worker must arrive at the job site every day. The same is true of the physician who will only make money when arriving at a hospital, emergency room, private practice or medical group. Each hour given returns a rate of income. Nobody automatically gets rich this way. Not doctors, attorneys and other highly paid professionals. Passive income provides the opportunity for wealth, which is defined by expanding net worth. It arrives without giving away one hour or forty hours of life for money. Passive income is derived from the right kind of real estate investment that takes legal good use of tax laws and the economy. Everybody needs a place to live. Why not rent a dwelling to those who must have a roof over their heads? Isn’t that similar to helping people stay healthy by ministering to their physical needs? Flu, cancer, surgery, etc. The money that is earned in any profession can be put to good use or it can stagnate in paper assets. Hard assets, property, will serve us all well—doctors and UPS employees alike—when we learn the laws of economics that reward those of us who understand risk and take a leap into multi-family real estate investing.